SCP-1160 before initial containment. Image dated Aug. 15th, 1915. Special Containment Procedures: SCP-1160 is currently contained via Foundation Protocol Tango-77. Foundation assets are to maintain surveillance of SCP-1160's area of captivity. Changes in the behaviour or appearance of SCP-1160 are to be reported to the off-site containment team at Site 95. In accordance with Protocol Tango-77, the distribution of the Super Coco Pows brand of breakfast cereal has been allocated to Site 95, which also currently oversees marketing and manufacturing. 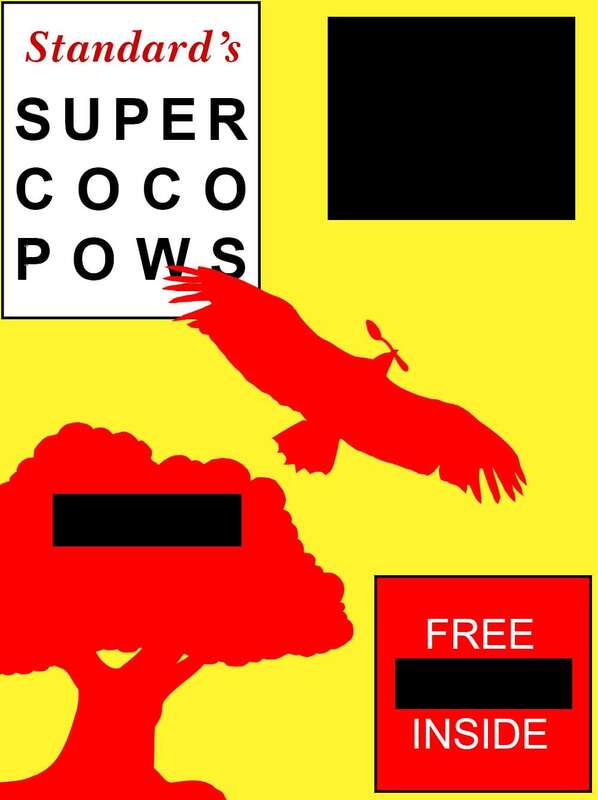 Any deterioration of the Super Coco Pows brand is to be considered a Level II Info-Hazard Emergency. The Buzzard came again last night, larger than before. Its cry we heard first, the great gnashing of a terrible demon. It appears not like the mainland creatures, but something far worse, pulled from some devil's pit in eons past. The Buzzard tore through our defenses, and we had no choice but to flee to the sea, or take shelter in the earth and pray that it would not root us out. Every night that The Buzzard returns, he is more and we are less. While SCP-1160 can sustain damage, it is for all practical purposes considered indestructible, as SCP-1160 is capable of rapidly and fully regenerating lost or damaged tissue, and is able to withstand all forms of conventional firearms, or explosives below 300kt. Additionally, SCP-1160 has a number of insect-like optical organs situated around the head and back, capable of providing SCP-1160 with a virtually 360 degree perspective of the area around it. These traits, combined with the natural brute strength and speed of SCP-1160, make the entity particularly deadly in close combat. However, SCP-1160 is also negatively affected by human cognition, a trait that has been manipulated by Foundation Protocol Tango-77 to provide a comprehensive, long-term containment solution for SCP-1160. The rate at which human perception of SCP-1160 increases is directly related to the rate at which SCP-1160 undergoes systemic biological decay, and the number of individuals who are cognizant of SCP-1160's nature is inversely related to its overall size and strength. This effect, however, is not instant, and seems to take place over the course of several hours after initial cognition. While it is believed that SCP-1160 could feasibly continue to decrease in size indefinitely, the limits of this effect, if any, are unknown. During initial discovery of SCP-1160, a team of Foundation scientists hypothesized that the sudden, sharp drop in aggression by SCP-1160 was in some way related to the arrival of Foundation personnel on ██████ Island. On 08/13/1943, after routine amnestic cycling of Class-D individuals assigned to Site 77 on ██████ Island, SCP-1160 attacked both the Foundation facility and a nearby fishing village. During the attack the entity was noted as being highly aggressive and notably larger, inadvertently resulting in the loss of █ Foundation personnel and ██ other inhabitants of the island. In response to this discovery, Foundation assets were allocated to the creation of Protocol Tango-77. The project, codenamed "Saturday Morning", was begun with the intent of spreading awareness of SCP-1160 to a large, consistent group of human subjects, which would in turn weaken and aid in the containment of SCP-1160. In 1953, after a ten-year period of development, initial trial runs of the protocol were enacted. An early mockup of the Super Coco Pows cereal box, dated 1954. Anomalous memetic features have been expunged. On 05/14/1953, a Foundation front company, "Standard Products" released the "Super Coco Pows" breakfast cereal, which began marketing heavily towards children. The mascot of the brand was "Bradbury Buzzard", a cartoon caricature resembling SCP-1160. This character was featured prominently on the front and back of the box, itself containing a number of subtle anomalous memetic triggers intended to plant specific pieces of information concerning the nature and appearance of SCP-1160 into the subconscious of its targets1. Over time these triggers have been adjusted slightly to avoid over-proliferation of sensitive information, and the most recent product surveys have returned positive results. Where once consumers would reply that Bradbury Buzzard is a "mean buzzard who lives on a secret island and hurts people", consumers now tend to respond that the character is a "mischievous little bird who lives on a tropical island and tries to nab Super Coco Pows from various young children." 1. Initial triggers were reverse engineered from existing memetic phenomena, such as SCP-2061, SCP-2076, and RED TALISMAN.